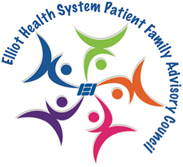 The Elliot Health System Patient Family Advisory Council (PFAC) serves as “the voice” of patients and family members in the community. These dedicated individuals work in partnership to serve as a formal mechanism of involving patients and families in policy, program and organizational decision, thereby assuring alignment and integration of patient and family center care across Elliot Health System. Membership includes patients, family members and representatives from Elliot Health System (EHS). Through their unique perspectives, each PFAC member provides input on issues that impact care, ensuring that the next patient or family members’ journey is easier. Encourages partnerships between Elliot Health System staff and providers with patients and families. Promotes dignity and respect for all patients and families across the Elliot Health System. Facilitates information sharing between providers, patients and families. Serves as champions of the Elliot Health System patient experience across the health system. Our council meets monthly and we are always seeking individuals who come from a cross-section of our community, have chosen Elliot Health System for their healthcare needs and wish to enhance relationships between patients, providers, staff and our community. For more information about becoming a PFAC member, please call 603-663-2193.